Last time when we saw each other was back in 2002 in Tokyo. There I asked you about the history of art therapy in America – the miracle that had happened in the very beginning of its development in the early seventies. And we finished the interview with what would happen to Art Therapy in the following ten years. There you predicted that we would see much more collaboration between artists and art therapists. That was one thing. Another thing was art therapy is making interesting development not only in mental health field but also in physical health. Now it is 2013, ten years have passed. So, I would like to ask you, how do you see the last ten years? Last ten years in America, art therapy continued to grow because of something called licensure. Many art therapists are now licensed, usually as counselors, but sometimes as marriage and family therapists, social workers, psychologists, and in a few states as art therapists. It allows art therapists or their employers to get reimbursed for their services by the insurance companies. It is different from certification or registration because a state or government, not an organization, has to recognize that the person has the skills that are defined in order to practice, like doctors, nurses, psychologists, and psychiatrists who are all licensed. Are you talking about the license of Creative Arts Therapists in New York State? Well, New York is different from most other states. They have categorized music therapists and art therapists together as what they called Creative Arts Therapists. Most states don’t. In most states art therapists ended up with a license as a counselor. These licenses have grown tremendously, very fast. So the art therapy training programs had to add counseling courses. California, like New York, is different from most others. They have Marriage and Family Therapy licenses. So, it is practical. They need training programs to get art therapists into positions where they can work and the insurance companies will pay. Around the world, it is another story. I think the UK has made the most progress in making sure that art therapists are included in the National Health Service. Yeah, some of them are shown in your DVD. Yeah, they continue to be more recognized. Diane Waller, who is in the DVD, was one of the big reasons. Because she was put on the committee that had the responsibility for licensing mental health providers, art therapy was included. Do you know Paola Luzzatto? Yes, she visited me at Hasegawa Hospital where I have been working for, around fifteen years ago. She joined my art therapy group for chronic psychotic patients. She was teaching at Pratt at that time, so we had a lively conversation over various subjects such as the present situation of Pratt, faculties there whom I know, her class and the situation of art therapy in Japan, having a nice view of Mt.Fuji. Before we leave, she said she would go back to Italy then and, to my surprise, start the art therapy program for the dying people of cancer in the site of the famous monastery in Assisi the following week. There is also a group organized by Paola in Europe. There are over 30 members, one from each of 28 European countries. The group is called the European Network and Study Group. There is also an organization called ECArTE. That’s European Consortium for Arts Therapies Education. They are not just art but also music and drama and dance, all the arts therapies. They have this group of universities, but people go to the meetings because it is a way of meeting people from other countries. And Paola’s group is working hard to try to establish a core curriculum for art therapy training, because even though most European countries have some kind of art therapy programs, they are at very different stages of development. Some are sophisticated like the UK and Finland, and some are less sophisticated, where they have many different training centers, and each one does it very differently. They don’t have, for example, an organization for all of Europe that would be like AATA in America: the different countries being at different stages. That hasn’t happened yet. But they are talking to each other. Many centers in Europe?! Wow! Yes. It is a big step, very big step. It’s happening in South America, too. Art therapy is growing very rapidly. Same picture, though. Some people in different countries, for example, who have some training, are more sophisticated than others. Some have a private practice, sometimes there is an institute or a university training program, but as in Europe there is great variation. They are just at the stage of trying to set standards. They have had several Latin American art therapy conferences. People from different countries have come. That’s in the film, too. It’s really amazing and very encouraging. Okay, so to get back to your question about artists and medical settings. It’s very interesting because I’m in the middle of organizing a conference in Washington, D.C. This particular meeting is focusing on the Creative Arts Therapies – art, dance, drama, music, and poetry – in Medicine and Healthcare. And the reason we are doing it is because something called the Global Alliance for Arts & Health (formerly the Society for the Arts in Health Care) is having a meeting that ends on Friday, so we are doing something from Friday night to Sunday. 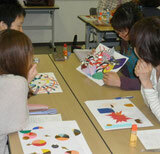 But that group is a mixture of arts therapists and artists, such as artists in residence. You know about that group? Yes, I remember one of the organizations in Japan had invited them and had a conference ten years ago. It’s big. It’s cheaper for a hospital to hire an artist than hire an art therapist who’s had two years of post-graduate training and a lot of supervision, you know what I mean？ So the competition is keen, and yet in some settings they work together very well. And that’s my goal to get more places and more people to do that in a healthy and collaborative way. Oh, you might know these two model programs I have included in this conference. The models include the arts therapists along with other providers. For example, one is at the Cleveland Clinic and the other is at Mt. Sinai Hospital in New York. Did you meet Diane Rode, a Pratt graduate, who is at Mt. Sinai? Diane at Mt. Sinai employs Creative Arts Therapists like art therapist, music therapist, I think maybe… I’m not sure if she has drama therapist because somebody does poetry, along with Child Life Specialists. And they work together. And arts therapists are similarly well integrated at the Cleveland Clinic where they have something called the Arts and Medicine Institute. And they employ art and music therapists along with artists in residence and performing artists. So it’s a challenge to have these groups to work supportively together because of the inherent competition. Yeah. It’s an endless competition. You know, people need to work. Hospitals have a limited budget, and they have to decide whom they employ. But sometimes it works out in an interesting way. Like this one woman, Tina Lassiter, who is going to be in the symposium in Washington, D.C. - she is an artist and she runs the Creative and Therapeutic Arts Services at National Children’s Hospital in Washington, D.C., which is a federal hospital. And when she came, she told me that she realized that the artists in residence weren’t sensitive enough to understand what children were going through and she wanted them to understand more, so she started to hire more art therapists. And now she has the artists being supervised by the art therapists. That’s what sometimes happens in places where I think it’s well integrated. But it’s been a kind of economic and also, to some extent, ideological struggle. Not easy. So it’s happening but happening, like most things, with certain amount of bumpiness and folk are defining themselves and figuring out, hopefully in a way that helps patients. So, is it a current trend in the States that artists and art therapists work together in their settings? I would say some settings are better than others. And usually, it’s sort of like, our world is still run by people who make decisions, and so Diane Waller being on the Council of the Professions in the UK helped to include the art therapists in the regulations. Similarly, whoever runs the program in a hospital or a clinic or any setting has a lot to do with how the artists and the art therapists interact. It’s really up to that person and how they see it. Sometimes, for example, in one hospital in Cleveland… I just finished a film about Mickie McGraw She co-founded a hospital based program. It’s in a rehabilitation hospital where people go after surgery or after a stroke. In those days, it was 1967, they stayed longer. She and a psychiatrist had the idea of starting an art studio, where it hadn’t been formed yet. It was before art therapy training programs, before there really was such a profession. They grew into quite a large operation in a hospital in Cleveland. And they have an artist in residence program also in the hospital. However, they do work together. They collaborate, they… I think the people in the art therapy program actually help to organize when artists in residence come and see the patients. So, there are many places where they work very well together, but not always. I think this kind of information is good not only for art therapists but also for artists and art students who may be interested. Yeah, I think so. As a matter of fact, I think that’s what sometimes happens. Some people, well, all of the people who went into art therapy in the early days were artists. We all started that way. We were artists in residence and somebody asked us to come and work with patients. But it was mostly in psychiatric settings. Now it’s broadening into other kinds of medical settings. Also there are art therapists in prisons, hospices and many community settings and wellness groups. Wellness groups have become kind of popular since the human potential movement in the 1960’s, you know. So some art therapists are very active in that. Could you tell me more about the idea of wellness groups because I am interested in working with older adults who have retired. I think it’s a good opportunity for them to introspectively review their lives, like “What’s the meaning of life?” and to make a life story through an art group. I tried a couple of groups in a cultural center. It was a big success. We got quite a few participants and most of them had deep experiences though artwork. Yeah, you’re absolutely right. That is a scene where art therapy is growing too. I am in that age group now. We have many more older people in the United States than ever before. copyright 2010- j-cat-c. All Rights Reserved.